Seattle, WA — Antiwar activists filed a brief today in Panagacos v. Towery, a widely watched military spying lawsuit from the Pacific Northwest currently on appeal before the Ninth Circuit. The brief draws attention to a recent policy change by the Department of Defense (DOD) prohibiting intelligence officials from engaging in the same type of questionable surveillance the Army has admitted to conducting for years against antiwar groups and other political organizations. Earlier this month, cryptome.org obtained the most recent manual for “Procedures Governing the Conduct of DoD Intelligence Activities,” which has a new section 3.10(e)(2) prohibiting the surveillance “for the purpose of collecting information on the domestic activities of U.S. persons.” Under another new section 3.10(b)(3), the manual also prohibits military intelligence officials from anonymous spying on email listservs. The DOD policy change comes one year after antiwar activists appealed a summary dismissal of the Panagacos lawsuit, which alleges widespread Army surveillance and infiltration, the disruption of constitutionally protected speech, and the very same surveillance activity the military is now trying to outlaw. Despite the importance of the Panagacos case to the public interest, the plaintiffs were forced to file the appeal last year under seal. Public records obtained in 2009 established that over a three-year period beginning in 2006, Army analyst John Towery (under the alias “John Jacob”) infiltrated and spied on the antiwar group Port Militarization Resistance (PMR) as well as several other organizations, including Students for a Democratic Society, the Industrial Workers of the World, and Iraq Veterans Against the War. Not only did Towery admit in a March 2014 deposition to routinely being paid by the U.S. Army to gather intelligence and disseminate it to his military superiors as well as to the Washington State Fusion Center, a communications hub of local, state and federal law enforcement, but Towery’s information was also circulated to police departments in multiple states, and used to disrupt planned protests by preemptively and falsely arresting activists. Both Towery and his supervisor at Joint Base Lewis-McChord, Force Protection Division Chief Thomas Rudd admitted to anonymously spying on email listservs run by various political groups. Towery also took confidential information from an attorney-client-protected listserv and gave it to prosecutors in a pending criminal case thereby causing a mistrial. In addition to these constitutional violations, Towery, Rudd and other Army personnel also violated Posse Comitatus, which prohibits the military from enforcing domestic laws on U.S. soil. After an Army investigation in 2009, Rudd said he was reprimanded for his conduct but, despite this, Rudd admitted in an April 2014 deposition that he continued to anonymously spy on email listservs of political activists in order to assess their threat to Army operations. 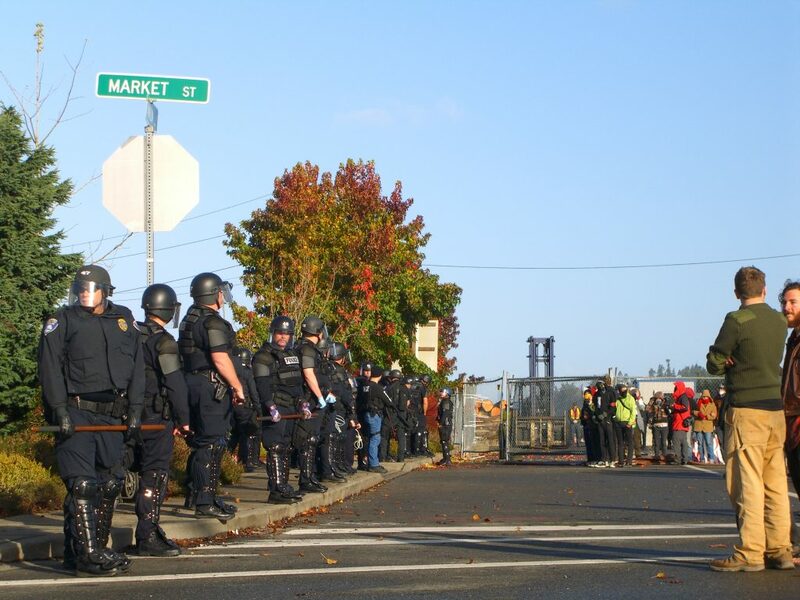 While PMR was active, the group protested shipments of military equipment and weapons in and out of the civilian Ports of Olympia and Tacoma. For years after, both ports refused such shipments but the Port of Olympia recently started to reconsider its ban on military shipments. Plaintiffs in the Panagacos lawsuit are currently waiting on the Ninth Circuit to schedule oral arguments in the appeal. Named defendants in the case include Towery, Rudd, the U.S. Army, Navy, and Coast Guard, as well as certain officials within its ranks, the City of Olympia and its police department, the City of Tacoma and its police department, Pierce County, and various personnel from those jurisdictions.